> > family, which appear to use a sectored L2 with 128-byte lines and 32-byte sectors [*]. > reference manual, but anything else simply does not make a technical sense. The GT3(e) GPU occupies about twice the die area as GT2. Operating on the assumption that the GT3e die really has an 8MB L3 array with 2MB repurposed for tag, you'd guess that the GT3 GPU is therefore 2*(264-177) = 174mm^2, a calculation Anand makes. 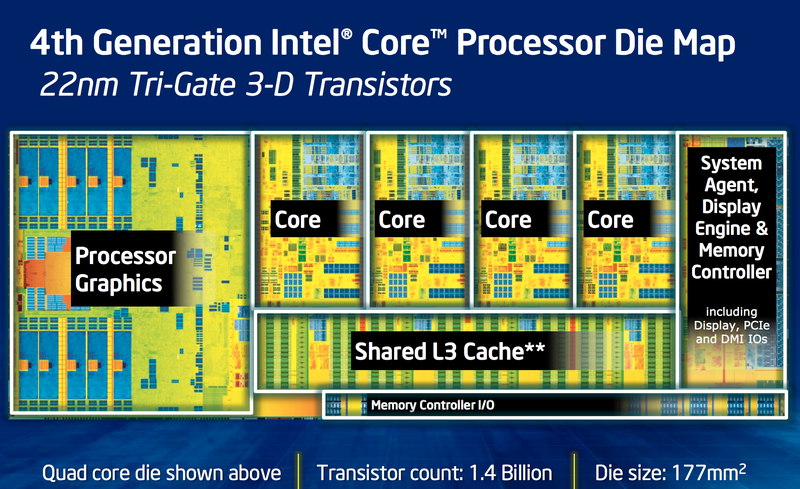 But he didn't notice that this is absurd: that's just 7mm^2 less than the entire GT3 dualcore die. So clearly there's something adding substantial die area to Crystalwell other than the GPU. The other thing which suggests Intel isn't building a die that can repurpose part of the L3 array is simply that as of now, they have not announced a single 264mm^2 Haswell quadcore with 8MB L3 and without Crystalwell. That die appears to be for Crystalwell only.